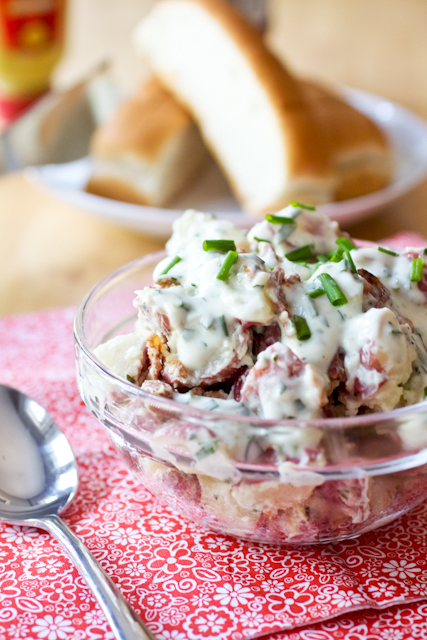 For this bacon ranch potato salad, forget using mayo! Add some ranch dressing to the warm potatoes, mix it with bacon and scallions and start winning! In my lifetime, I have passed over hundreds of offerings of potato salad. I don’t know what the trigger was for my distaste of it but I do know that gloppy mayonnaise-based salads have never been my thing. Apparently, my grandmother makes the best potato salad and it’s the only version that has been brought to nearly all of our family gatherings in the summer months. I just never got the appeal and I’m sure there were plenty of heads being shook at my countless refusals. So along comes bacon ranch potato salad. I’ll admit, I was completely turned off the by the idea of it…until I realized that it wasn’t a gloppy mayonnaise-based potato salad, but one made with ranch dressing. Yes indeed, ranch dressing! With the addition of crispy bacon bits, this potato salad is a match made in heaven. Rather than completely chilled, I served it while the potatoes were still slightly warm, while the dressing still had a chance to soak into the potatoes. And I loved it..as did Kyle who could eat potato salad any day of the week. I will not likely ever be a traditional potato salad eater, but this bacon ranch version is one I can definitely get behind. In an 8-quart stock pot, cover the potatoes with cold water by 1-inch and add the salt. Bring the potatoes to a boil over high heat then reduce to the heat to medium and cook the potatoes until fork-tender, about 8-10 minutes. Drain and set aside to cool down until they are very warm, about 5-10 minutes; transfer potatoes to a large bowl. Pour half of the dressing over the potatoes and stir to coat the potatoes well; refrigerate for 1-2 hours. When ready to serve, stir in the remainder of the ranch dressing and bacon. Garnish with chives or scallions, if using. i love mayo-based potato salad, but i also love all kinds of potato salad so i’ll have to try this! that would be called “german potatoe salad’ back from where i’m from. haven’t thought about that for a while – thanks for the memories of grandmom it brings back. and yes i do prefer this version compared the mayo typed version also.